With its gorgeous canals lined by historic architecture, Venice is one of Italy’s most famous destinations for good reason. Venice consists of 117 small islands and over 400 bridges, a veritable maze of a city. And with everything else to visit in Italy, you probably don’t have several days to spend exploring and getting lost in the Floating City. That’s ok though, because as long as you have good plans in place, it’s possible to see the highlights of Venice in only half a day. Located in the lagoon facing the Adriatic Sea, Venice is a fish-shaped island made up of 118 smaller islands. Easy to reach from many Italian cities, simply hop on a high-speed train for a day trip from Rome or Florence and arrive in no time at all. Train travel makes seeing Venice in half a day easy. Find timetables and departure times on the Trenitalia website, by selecting Venezia S. Lucia as your arrival station. Plan ahead and leave early in the morning to get the best deals. Just remember, in order to see as much of Venice as possible, it’s imperative to arrive as early as you can in the morning. If you want someone else to handle the details of your visit to Venice,The Roman Guy offers outstanding Italy Trip Planning Services. Once you arrive in Venice, the best way to get around is by foot. All the main tourist attractions are within walking distance from one another. However, public transport is available via expensive water taxis, traditional gondola rides and easily accessible ferry boats. And finally, check out the timetables and ticket prices for the vaporetto on the ACTV website. Taking the ferry boat is the best way to get around in Venice. When you arrive at the Venezia Santa Lucia train station (the final stop on the line! 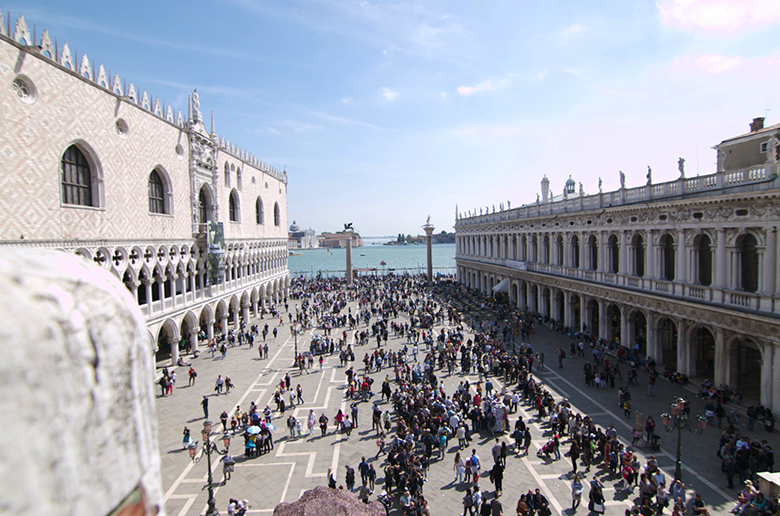 ), head straight to St. Mark’s Square. But first, make sure to take in the incredible view from right outside the train station. Don’t take the heavily-trafficked Strada Nuova – take the less popular Ponte degli Scalzi. St. Mark’s Square is about 30 minutes by foot or ferry from the train station. 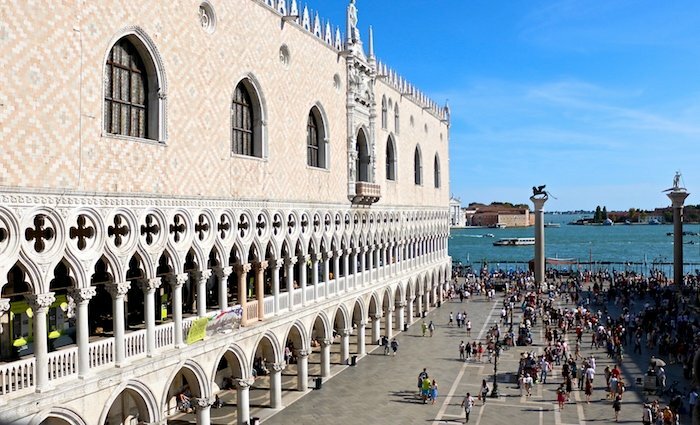 Home to the magnificent St. Mark’s Basilica, Bell Tower and Doge’s Palace, this is the biggest square in Venice and the only one that Venetians call a piazza – the smaller ones are called campo. While you’re in St. Mark’s Square, there are three main attractions to check out. The Bell Tower – Over 99 meters tall, the Bell Tower (or campanile) was once a lighthouse and watchtower. It sill hosts one of the best views of Venice. Visit at sunset for a truly epic experience. Doge’s Palace – Within its underground levels, hidden from most tourists, are the cellars where the infamous Casanova was imprisoned. Visit the prison cells and the rest of the gothic palace on a Doge’s Palace Secret Itineraries tour. St. Mark’s Basilica -Known as the “Church of Gold”, St. Mark’s is one of the most-visited places in Venice. To go inside the basilica, either buy your tickets on the Veneto Inside website or take a guided tour. That way, you’ll avoid waiting in line for over three hours on average. Insider Tip: if you want to have a real Italian coffee experience at one of St. Mark’s Square’s historical cafes, go inside and have it at the counter. Espresso at Caffè Quadri is only €1.10 if taken al banco (standing up), otherwise you’ll have to pay a hefty premium for the views outside at the tables. 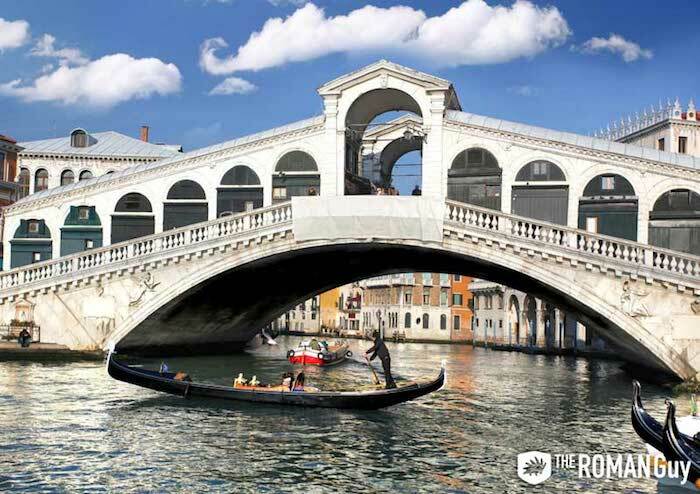 Just a few minutes away from St. Mark’s Square, find the Rialto Bridge, another one of Venice’s best attractions. Initially built from old boats, the unstable bridge was rebuilt in 1500. It is still the best passages to access the Rialto Market, a place that’s been whetting appetites for seven centuries. 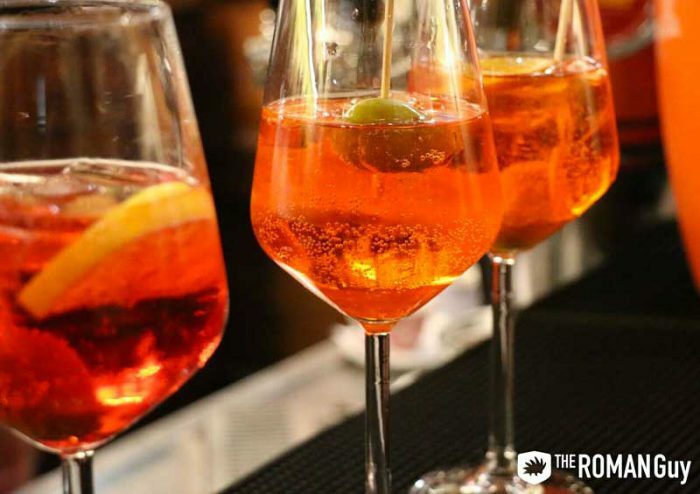 Stop at the nearest cicchetteria (local pub) for some wine or spritz and a small meal. We suggest All’Arco, a local favorite, which offers takeaway fresh cicchetti (fingerfood) with seafood at reasonable prices. How about a Gondola Ride? Even though you’re only exploring Venice in half a day, don’t skip the ultimate Venetian experience – a gondola ride. The Rialto Bridge and St. Mark’s Square are both perfect spots to grab a gondola ride and get a jaw-dropping view of Venice from the Grand Canal. Due to the incredibly high demand for gondolas and the scarcity of boats, gondola rides are expensive. 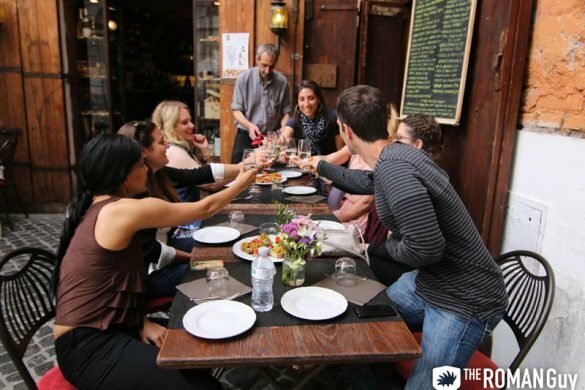 If you want to save some money, split up the cost between five or six people (new friends or the people you’re traveling with). Insider Tip: A Gondola ride included in our Hidden Venice Express Tour. For €59, see Venice’s main attractions in just 2.5 hours. 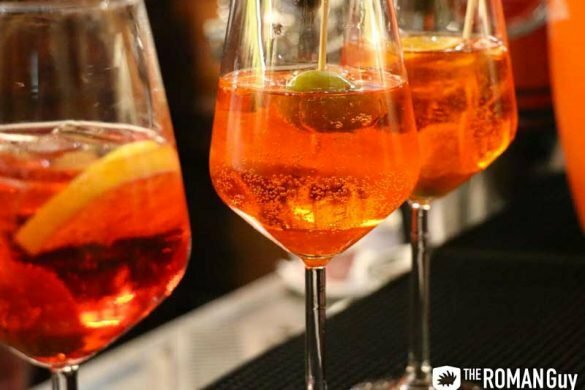 After all that sightseeing, treat yourself to a final Aperol Spritz in Campo Santa Margherita. This big square comes to life at night, but also makes the perfect location for a quick meal and drink during the day. Insider Tip: Go to Bocon DiVino for some delicious polpette and baccalà. Don’t forget to stop at one of the typical Pasticcerie close to the train station and buy some buranelli. Don’t get lost. Let us take care of the navigation, tickets and transportation on on our Hidden Venice Express Tour. 2.5 hours full of fun and discovery of the lagoon. Are you planning on spending a full day in the Floating City? Check out our tips about what to see and do in Venice in a day. Impress your friends and families with these Ten Weird Facts About Venice. Hungry for some traditional Venetian foods? 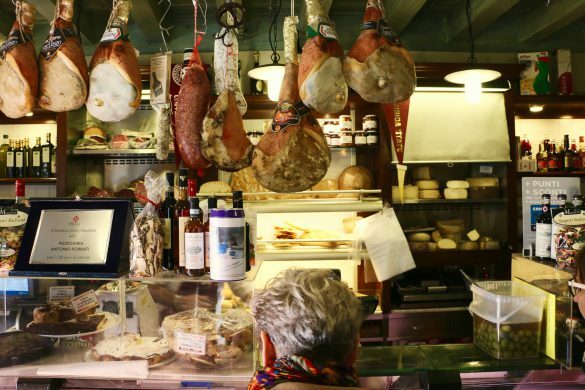 Take a Venice food tour.